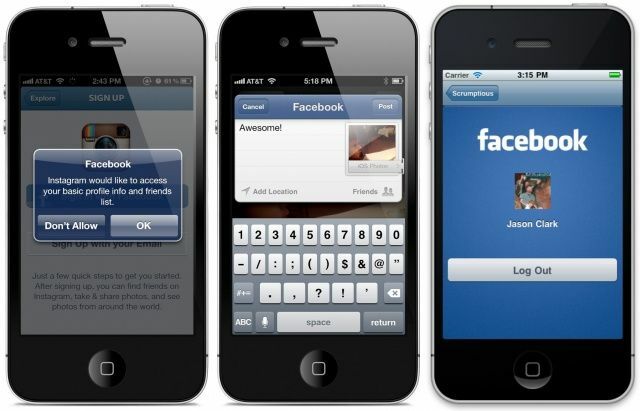 The latest Facebook SDK makes the Facebook on iOS experience even greater. With the new SDK, developers can build iOS apps that use the native login support in iOS 6, meaning if you’ve already logged in via the Settings app, you won’t need to do it again in third-party apps. It also supports ad analytics, improved API support, and easy session management. Friend Picker to help apps easily pick friends. Example: use a friend picker to choose friends to tag in an Open Graph action. Places Picker so apps can easily integrate with Facebook places. Example: use this picker to let users include a place with their posts. Profile Picture control so your app can easily show the profile picture of a user, their friends, places, or other kinds of Facebook objects. Login controls for easily building Login and Logout experiences. Drop these controls into your apps to build fast, native and consistent experiences for common app features. Seamless Facebook Login across iOS versions: Lets your app work seamlessly on all iOS versions 4.0+ and easily integrates with the native login support in iOS 6. Easy session management: Introduces the FBSession API that manages, stores, and refreshes user tokens. You can also override default behaviors to build advanced features. It uses the modern Objective-C “block” metaphor to notify your app of login, logout and other session state changes, and it instantly integrates with iOS 6. Improved API support: Minimizes the code you need to call Facebook Graph, FQL, and other APIs. It natively supports batched API requests to significantly improve performance for API calls, which translate into faster, better user experiences. Ad analytics (Beta): Lets you record analytics to give you information about the effectiveness of your ads and understand how people use your app. Learn more about the mobile ads product. For users, the latest SDK should mean better Facebook integration in third-party apps. We won’t need to enter email addresses and passwords again to share content with our friends, when they’ve already been entered within iOS 6’s Settings app. That’s certainly something we can all appreciate. Developers can download Facebook SDK version 3.1 now using the source link below.